February 10, 2012 January 23, 2015 / Julie Brook, Esq. Hard economic times mean more cases of arson. Indeed, the United States Fire Administration dedicated 2009’s Arson Awareness Week to focusing on “arson for profit,” i.e., fires set by individuals seeking to cut down on financial loss, recoup investments, or get rid of depreci­ated assets, usually for a payout from insurance com­panies. Ever wonder how investigators tell an accidental fire from a for-profit venture? The National Fire Protection Association (NFPA) defines a fire that has been “deliberately ignited under circumstances in which the person knows the fire should not be ignited” as an “incendiary fire.” NFPA 921 §22.1. 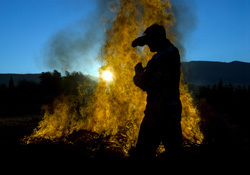 Under the California Penal Code, “[a] person is guilty of arson when he or she willfully and maliciously sets fire to or burns or causes to be burned or who aids, counsels, or procures the burning of, any structure, forest land, or property.” Pen C §451. When the smoke clears, an arson case is simply a fire investigation that resulted in a finding of an incendiary fire. Such a finding demands a careful and thoughtful analysis of the evidence to determine that an intentionally set fire really exists. Multiple fires. This means two or more simultaneously burning separate fires with no obvious connection. See NFPA 921 §22.2.1. Multiple fires result from the application of an ignition source at multiple points to ensure that destruction results. Spread fires. Arsonists may attempt to spread fire from one area to another by linking separate fires together with combustible fuels or ignitable liquids called trailers. One fire will, in turn, ignite other fuels via these trailers. See NFPA 921 §§6.3.7.10.1, 22.2.2. Fire in an area with a limited fuel load. Fire investigators frequently refer to the “total quantity of combustible contents of a building, space, or fire area” as the “fuel load.” NFPA 921 §3.3.78. When a fire occurs in an area with a limited fuel load (e.g., a stairway or hallway, or a vacant building), the fire may be incendiary. See NFPA 921 §22.2.3. Fire in an area without likely ignition sources. When the fire originates in an area that has limited potentially accidental ignition sources, such as an attic, a closet, or a crawl space, the fire may be incendiary. See NFPA 921 §22.2.3. Unusual circumstances. When the area where the fire originates contains (1) an unusually large fuel load, (2) a fuel load placed in an unusual configuration, or (3) a fuel load where contents are unusual or unexpected for that location, the investigator may suspect an incendiary fire. For example, a firesetter may stack up furniture in the middle of a room or may put cardboard boxes or other flammable material in the living room in an attempt to encourage the fire. See NFPA 921 §22.2.5. For everything you ever wanted to know about the origin and causes of fire, turn to CEB’s Scientific Evidence and Expert Testimony in California. And don’t play with matches!